Those are the words Pelle Von Schwedler Wall says his father said when he walked into his bedroom of their downtown Salt Lake City home the morning of Sept. 28, 2011. 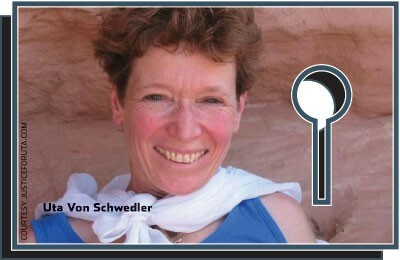 Uta Von Schwedler, 49, a University of Utah biologist and HIV researcher, had been found the day before by her boyfriend, Nils Abramson, at her Sugar House home in an overflowing bathtub of cold water. A scrapbook she had made for her youngest child floated above her submerged, nearly naked body. A knife was found beneath her when the tub was drained; she had cuts on her left arm and leg and bruising around her neck and face. It was that statement that Pelle says scared him the most and made him unsure of what his dad was capable of. “I didn’t know if there was some switch that triggered him,” Pelle said in a recent court testimony. In 2011, high school senior Pelle Von Schwedler Wall was a student body officer, a varsity soccer player and a straight-A student at East High. He had plans to follow the example of his parents and study medicine. He had a heavy course load of several university-level classes, including Calculus 3 and genetics, and spent his free time volunteering as a mentor to refugee children and refereeing soccer on weekends. It seemed as though the thin-framed young man was already carrying the weight of the world on his shoulders, but in the wake of his mother’s death, Pelle was launched into the kind of life he’d never imagined, one that had him living in fear of his father while trying to fight for justice for his mother. When he found out his mother had died, he immediately suspected his father. He knew his father better than anyone else, he says, and knew his mother’s death wasn’t a suicide. A month after Von Schwedler’s death, Wall, a pediatrician, took his children to visit his parents in California. Pelle brought along a knife, hidden in his backpack, for protection. Wall declined to comment for this story. A few months later, in January 2012, Wall asked Pelle what he knew about his mother’s death. Pelle had already started looking into getting an attorney, and had read the medical examiner’s report and heard what other family and friends had learned about what happened that night. But Pelle says he couldn’t let his father know he wasn’t on his side—John Wall was now his only living parent, and Pelle wasn’t old enough to move out. So, he simply said he knew only that she had drowned in a bathtub. Uta Von Schwedler was born April 13, 1962, the same day the famous Star-Club opened in Hamburg, Germany, with a performance by the then-unknown Beatles. The oldest of four sisters, she grew up in West Germany, where her father worked as a doctor. She studied biology at Bonn University and eventually moved to California. A childhood friend of John Wall’s introduced the couple to each other while Uta was attending post-graduate school and Wall was in medical school in San Diego. They married in 1990. They moved to Utah in 1994, where Von Schwedler worked at the University of Utah as a biologist studying HIV. Her research was published and selected as “one of most influential scientific papers published in the first 30 years of HIV research,” according to the family website JusticeForUta.com, which was used to collect memories of Uta as well as tips during the investigation. Those who knew Uta say she loved life, and she made many friends through her welcoming attitude. “She was just so generous,” Virginie Sangrin of France, wearing a sticker with the words “Justice for Uta” in a rainbow font, told City Weekly outside the courtroom at a recent bond-reduction hearing for John Wall. Sangrin first met Uta in 2005 when Sangrin came to Utah to interview for a job in the HIV lab at the University of Utah. Uta let Sangrin stay with her at her home because she knew what it was like to be a foreigner in a new land. Over the years, Uta extended the same hospitality to nearly a half-dozen other foreigners in the same situation. Since the two lived together for a couple of years and were the only ones working in a high-security facility, they got to know each other very well. “Our friendship grew very quickly,” Sangrin says. She loved the outdoors and preferred colorful clothing to anything that hinted at formal dress. Uta brought her running shoes to work at the University of Utah and would coax others to join her on runs around the campus. She kept bikes for her family in her sister’s basement in Heidelberg, Germany, and would wheel them out to explore the city during visits. The summer before Uta died, Anna and her family flew from Germany to spend time enjoying the icons of the western United States, like Old Faithful at Yellowstone Park and white-water rafting in Moab. “That was the last time I saw Uta and told her that I was definitely coming back next year,” Anna wrote. “I came back, only just seven weeks later,” after Uta’s death, “to visit her memorial ... and in January to clean up her house. The two talked about Sangrin’s new job, Uta’s relationship with her boyfriend, Nils Abramson, and how happy she was. “And she also said that she really wanted to spend more time with the kids,” Sangrin said as tears filled her eyes. “Before they were divorced, I recognized that they shouldn’t be together,” Pelle, now 19, said of his parents in a recent interview with City Weekly. “Almost as far [back] as I can remember, there was a lot of contention and fighting.” He says he can’t recall a time when his parents publicly hugged or showed any affection toward each other. Pelle says he watched the relationship between his parents become even worse and more hateful by the day after they divorced in 2006. Police records indicate there were four documented domestic-violence incidents between the couple from 2007 to 2011. In 2007, a police report that was never prosecuted stated a neighbor witnessed Wall kick Uta in the backside in front of the four children after arguing about bicycles. He drove his car up off the driveway and into a flowerbed where she was working. Uta told police, according to a domestic-violence incident report, that she believed he was trying to run her over. Family members say that photo scrapbooks Uta made for all the children, like the one found with Uta’s body, were a constant source of contention between the couple. After Uta’s death, John Wall sued his son to get the scrapbooks back and demanded that no copies be made of them. The lawsuit is ongoing. The Friday before her death, Uta had a child-custody re-evaluation granted to her by the courts that potentially could have given her sole custody of the children.